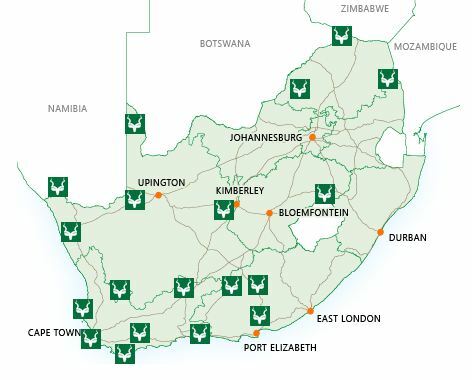 The annual South African National Parks (SANParks) Week (8 - 12 September 2014) gives all South Africans the opportunity to explore their local national park for free. 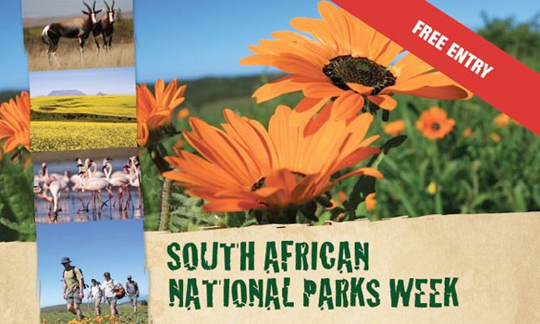 The theme for this year’s SANParks Week is Know Your National Parks. According to SANParks Acting Head of Communications, Reynold Thakhuli, the objective of the week is to cultivate a culture of pride in South Africans' relationship with the country’s natural, cultural and historical heritage. “When people start to take pride in the national parks, then we believe they will start to understand the importance of conservation”, he said. 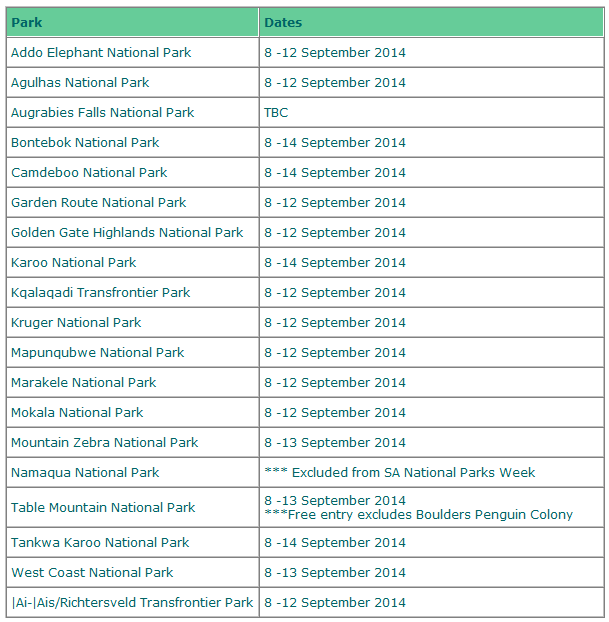 These parks have also extended the offer of free entry to include Saturday 13 September. Youth under the age of 16 will also be allowed free access without proof of identity. Any commercial activities in the park such as guided safaris in vehicles or guided walks, etc. Visit Cape Point and spend the day exploring the majestic most south-westerly point in Africa. Free guided marine walks along the coast of the Cape of Good Hope have been arranged and are available to the public for bookings on Monday 8 and Wednesday 10 September on a first come, first serve basis. Walks are scheduled for 10:00 and are two to three hours long. Early registration is essential, as there is only space for 25 people per walk. Similarly, the City of Cape Town will host a walk in conjunction with Table Mountain National Park (TMNP) during September celebrating Heritage month. The City will be hosting heritage walks for TMNP staff on 16, 17 and 18 September that will include the Slave Walk, Company Gardens and Prestwich Memorial. At the same time, the Park will be hosting City staff on a marine walk at Cape Point. The Two Oceans Restaurant at Cape Point will run a promotion for the duration of SA National Parks Week. Along with their free entry they also get a free trip on the legendary Flying Dutchman Funicular. While parents enjoy a scrumptious meal over a picture perfect setting. Children will receive a free meal at the Two Oceans Restaurant, if accompanied by a paying adult. Children also qualify for 20% off on a kid’s Big 5 dinner set at the Cape Point Lighthouse and Out of Africa retail stores. Agulhas National Park will host various nature walks from Monday, 8 September to Thursday, 11 September. For more information please call E De Kock or A Appel on 028 435 6078 during office hours. It is currently flower season and the West Coast National Park is in full bloom! Head to the Postberg section of the Park right now as this section is only open during August and September every year. Have something to eat at Geelbek Restaurant and then head off to experience the spectacular colourful carpets of wild flowers. The Seeberg Lookout Point, Mooimaak (by bicycle only) and Postberg are but a few must-see sites. Note: To save time in the queue at the gates, be sure to download the gate registration form and complete it before arriving. Use both the R27 and Langebaan gates as this will ease congestion at either one gate. Head to the park early in the morning, especially if travelling on a weekend or sunny day as these are the more popular days for visitors. Take a drive through the Bontebok National Park, just outside Swellendam. Park and spot some game; unwind alongside the Breede River, or take a walk through hills of Aloe, one of many scenic hiking trails. For more information, please contact Tarcia Hendricks via e-mail: tarcia.hendricks@sanparks.org or visit www.sanparks.org. Your transport needs will be seen to by Metrorail, Rail Tourism Department and their preferred bus-service provider HGTS Tours, whom are offering daily return train-trips from Cape Town to Simons Town, on their four coach exclusive train followed by a luxury-coach journey to Cape Point for the duration of SA National Parks Week (including Saturday 13 September). The cost for the transport package is R130 per adult and R70 for children (0 – 12yrs), students and senior citizens.